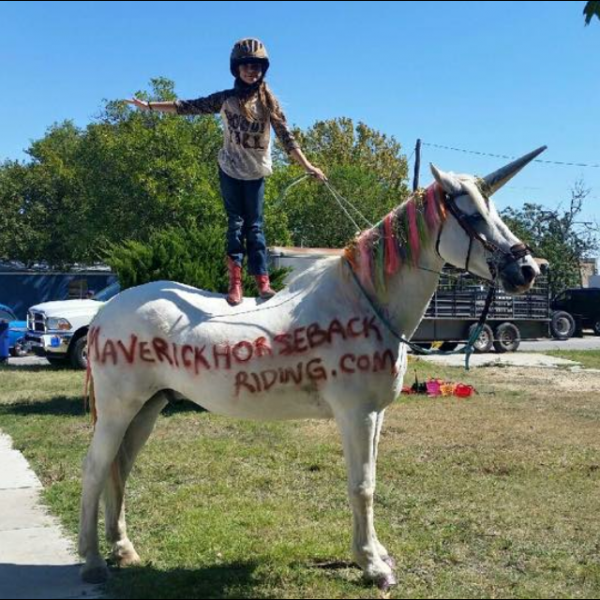 Saturdays are a popular time here at Maverick Riding Dude Ranch in Central Texas. Today, we are booked from sun up till sun down and we’ve got some pretty exciting things on the menu. But just because we are booked doesn’t mean you can’t get in on the fun. 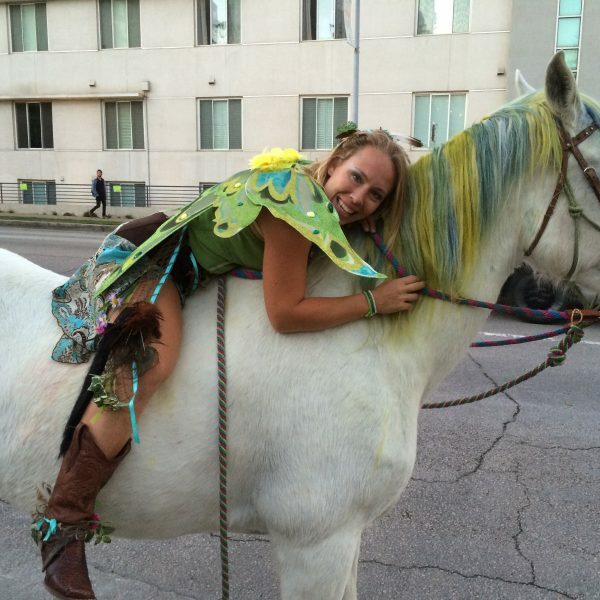 Volunteer to take a photo with our horse, ahem… that is… our UNICORN! While Equine trainer and riding instructor MacCoy is busy taking a group out to The Original Black’s Barbecue, Director of Unicorns, Perla, is going to be overseeing the creation of what will surely be our greatest unicorn creation yet. This time, we are using non-toxic soft pastels on Maverick’s glorious mane to fabricate a unicorn of the likes we can only imagine. Until he’s completed, of course. 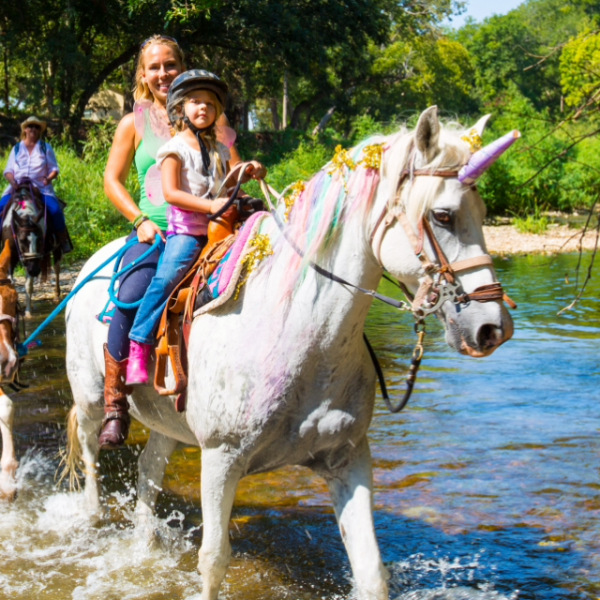 Take a trail ride… on a unicorn! Above poses MaKenna a horseback riding student of MacCoy, on Maverick during the Hutto Old Tyme Days Festival. We were contracted by the Chamber of Commerce of Hutto to bring out some horses, some education, and some fun. Maverick is sporting a pretty sweet rainbow mane with gold and silver decorations. This is solid advertising, right? Official SXSW unicorn loves to make appearances at summer camps throughout Austin! The great thing about unicorns is they come in all shapes and sizes. And while our unicorn happens to be none other than the glorious, magnificent, bigger-than-life Arabian/Percheron cross, Maverick, he is able to transform his colors to dazzle anyone from 2 to 92. 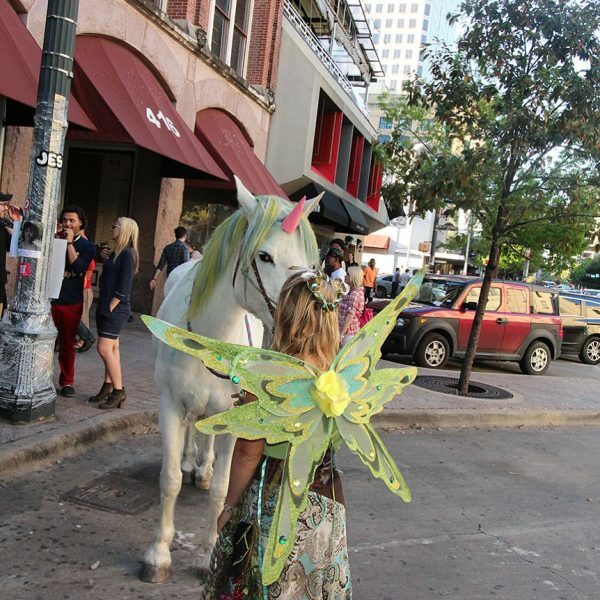 Here is Maverick, riding through the streets of downtown Austin as the Official SXSW Unicorn in 2016. He’s rocking a green and blue mane with a pink horse. Stupendous. We know. Summer campers let their creativity run wild by decorating their very own Unicorn! Above is MacCoy, being notoriously silly, engaging in the infamous buy etoricoxib online horse shenanigans that she missed as a child. See what happens when you grow up in a horse environment without ever owning a horse? It turns you into a perpetual child. The child MacCoy’s heart may often take a backseat to the woman who runs three businesses and manages a 100 plus acre horse ranch, but as you can see that child is still always there. And no one, NO ONE, can bring it out of her better than Maverick. Today, Maverick is going to sport his first ever RED unicorn, not only in spirit of Valentine’s which is rolling right behind the corner, but also because MacCoy has become the coach of a Spanish-speaking Lockhart Youth Soccer Association team. And that team color is… Red! Maverick Horseback Riding will be sponsoring the team, so lucky for us there’s going to be a pretty amazing photo opp for the players. Pictures to come! Below, MacCoy gives SXSW unicorn, Maverick, a hug. It’s moments like today, where we’re sitting here overlooking the valley, writing this to you, where we can’t help but take a deep breath and just Be Thankful. Life is Good, and horses like Maverick, and moments like those we just shared and that which is already in its works as Maverick gets a batch preparing for his remarkable transformation to Red Unicorn, are tangible, unforgettable, palpable, real. Because there is a child in all of us, and horses remind children to tap into the adult they will one day become while at the same time reminding adults not to lose the child at heart. So, want to discover your own inner child? Come out today and take a picture with Maverick the Unicorn, in what is sure to be one of our most unforgettable days yet!